The work of the NASC has been widely praised by speakers and delegates at the recent Access Industry Form (AIF) National Work At Height Conference. The conference took place at the Holywell Park Conference Centre at Loughborough University on Thursday 13th October and involved around 100 industry professionals and representatives from the 11 AIF member bodies, including leading trade associations and federations involved working at height. Conference keynote speaker, Phillip White, Head of Operational Policy and Strategy at the Health and Safety Executive (HSE) – who opened the conference, following introductions from AIF – praised AIF members, including the NASC specifically, for helping to “drive up health and safety standards in the work at height sector,” and made reference to the importance of the developing use of innovation and technology in the industry, such as the TG20:13 eGuide. 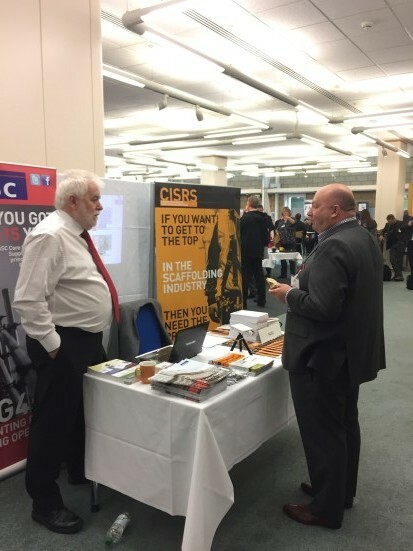 The NASC also had a successful display stand at the event, and handed out the NASC 2016 Safety Report, promotional material and the new CISRS CAP 609 General Information Booklet and ‘Have You Got The Right Card?’ posters, as well as fielding questions and enquiries from many event delegates. NASC Marketing consultant, Phil Royle added: “This has been an excellent and most useful event – with lively, engaging and informative expert speakers discussing a wide variety of work at height topics. The NASC recently re-joined the Access Industry Forum (AIF) – the UK’s leading platform for principal trade bodies and federations in the work at height sector – with effect from 1 July 2016. This conference was the first event NASC and CISRS have been involved with since rejoining. For details about the NASC – the UK scaffolding industry trade body – including becoming an NASC member and for details about the NASC Scaffolding Specification Document, new biennial scaffolding product innovation award, to order copies of the SG4:You 2015 pocket guide, information on the latest Safety (SG) and Technical (TG) guidance, or to order a TG20:13 full suite, please visit www.nasc.org.uk or email: enquiries@nasc.org.uk. And To obtain a copy of CAP 609, or the new cards poster or to find out more about CISRS, please visit www.cisrs.org.uk or email enquiries@cisrs.org.uk. CISRS has granted accreditation to a brand new scaffold training centre in the North East of Scotland – designed to meet the extensive needs of both the construction and oil and gas industries within the region. The £1 million, purpose built training facility based at Clinterty in Aberdeen is the result of a matched funding partnership between The Construction Industry Training Board (CITB) and ASET International Oil & Gas Training Academy (ASET). The business is the first scaffolding training centre in a region notable for the offshore scaffolding sector and will deliver a wide range of CISRS training ranging from apprenticeships to scaffold inspection. Courses offered will include: CISRS Operative Training Scheme (COTS), Part 1, Part 2 and Basic Scaffolding Inspection Training Scheme (SITS), the centre will look to further enhance accreditation in the future to include the full range of CISRS courses, Advanced Scaffolding and Inspection, Supervisory training, Systems courses etc. 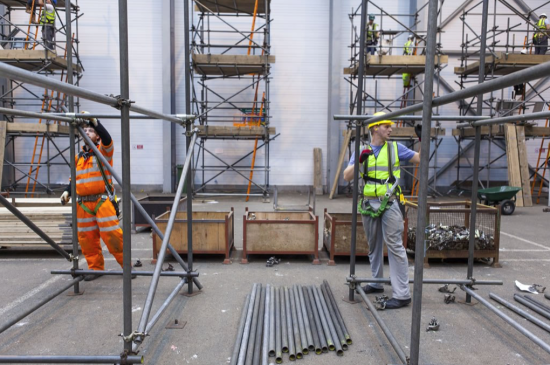 The centre aims to provide training for up to 50 scaffolding apprentices a year – with nine apprentices starting their apprenticeship in the first few weeks of the centre gaining accreditation. Atholl Menzies, Chief Executive at ASET, commented: “This is an exciting time for ASET and CITB as we begin to realise our vision of creating a centre of excellence for scaffolding training in the North of Scotland. This purpose–built facility is perfectly positioned to meet the demand for accredited training at introductory and advanced levels – from Dundee to Shetland. The facility will train and upskill the Scottish workforce and benefit both the construction and oil and gas industries. “The apprenticeship provision will help to attract new entrants into the industry, making an important contribution to the local economy. And the extensive range of commercial courses available will open up new opportunities for employers and individuals alike. A full listing of CISRS training courses at the new facility can be found at www.aset.co.uk. And for further information on the CISRS scheme, to obtain free copies of the CISRS General Information Booklet, ‘Have You Got The Right Card?’ CISRS poster, or any other relevant CISRS information please visit www.cisrs.org.uk or email enquiries@cisrs.org.uk.